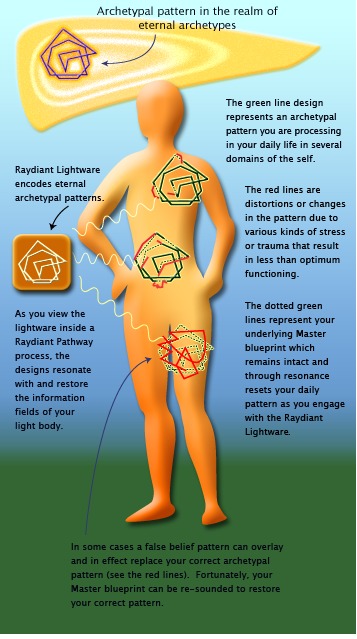 With an understanding of ourselves as light-energy beings whose nature is given ultimately by information fields made up of archetypal patterns, we can consider a theory for how Raydiant Lightware works. The realm of eternal archetypes exists outside conventional space-time while also pervading it. These eternal archetypes act as templates for what can come into being, shaping and coordinating the dynamics that out-picture in and as you, and everything in your reality. Your True Self incarnates as you, projecting the archetypal patterns you necessary for both your basic human physical, mental, and emotional function, as well as your personality, talents, predispositions, and life purpose trajectory. While you always retain this "master blueprint" of your “correct” patterns, your life experiences imprint new patterns in your light body, not all of them positive. Raydiant Lightware™ contains designs that encode the information embodied in the eternal archetypes. As you engage with the lightware designs, your own Master records are re-sounded. This act of resonating restructures or "raydances" your light body according to that higher order information. There may be many places within you carrying negative imprints. Each Raydiant Pathway session or "raydance" gives you an opportunity to clear more and more of these imprints at deeper and deeper levels. While a single imprint is reset instantaneously, the whole process may take several minutes as you move through different fields, resetting many different imprint patterns and many instances of those patterns. In this framework, all apparent form is a spectral nest of related morphic fields which resonate and conduct the information which controls the organization and development of the form. A form and its morphic field are different octaves in a resonant continuum. In this model, all types of form, even the helical DNA, act as a wave-guide antenna, receiving and transducing information from fields having a resonant affinity. Or said another way, the informative aspect of DNA comes from the morphic fields with which it has a resonance.